What Is the Meaning of the Pear Blossom? 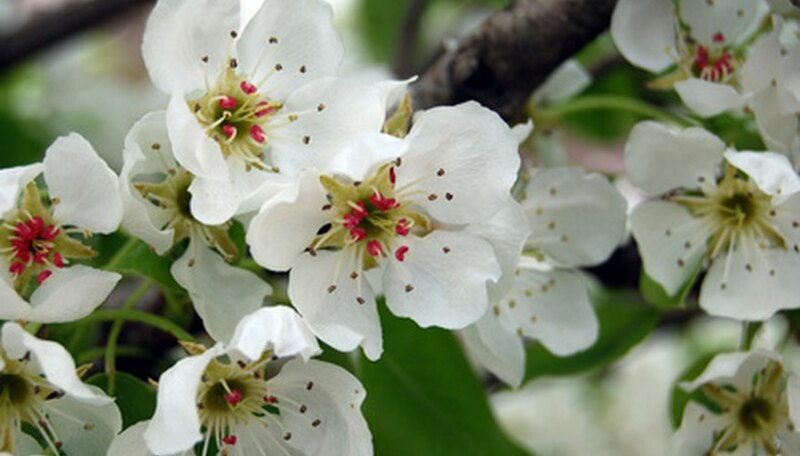 Pear blossoms belong to the Pyrus genus and produce pear fruit. Pear trees prefer temperate climates. The Odyssey mentions pears in the garden of Alcinous along with figs and olives. Pliny's writings also speak of pears, saying there were three dozen period types grown. It's likely that pear flowers and trees originated in Western China over 3,000 years ago. As the cultivation of pear blossoms spread to different regions they became symbols of various things. Pear trees blossom in spring. The white petals make them a lovely addition to bridal bouquets. Here they represent all the best hopes and wishes for a wonderful future together. Alternatively, the petals are strewn in the aisle. In 1863 Henrietta Dumont wrote "The Language of Flowers." Her work chronicled the meanings and sentiments for flowers common to the era. During this time, lovers used flowers to communicate thoughts that otherwise might be improper in gentle company. If you received pear blossoms from another, it symbolized enduring friendship. Depending on the setting, pear blossoms in poetry offered a variety of symbolic value. In England and China, both the flower's fragile beauty and delicate strength likened it to women. Robert Friend, in "Flowers of Perhaps," paints pear blossoms as a symbol of spring and hopefulness. Similarly, Hilda Doolittle wrote of the pear tree's flowers, in her poem "Pear Tree," as the harbinger of summer and earth's bounty. In the late 1800s, soldiers from around England were going to fight the Boer War. As a symbol of home, Lady Dudley presented volunteers with pear blossom favors made from silk. The volunteers wore these in their hats. After the war ended, pear blossoms became the badge for Worcestershire's Yeomen as a symbol of bravery and community support. Paintings by Ch'ien Hsuan in the 1200s and 1300s featured pear blossoms heavily, marrying painting with implied words from various poetic efforts like the "Book of Odes." In the writing and associated art, the flowers represent beautiful women. In 2005, Oregon named pears the official state fruit as requested by the Pear Bureau Northwest. During this ceremony, young girls appeared as a blossoming court and testified on behalf of the tree and its flowers. At this time, pears were Oregon's top-selling fruit crop.